Chatbots originated to serve a practical purpose – online customer support. Without picking up the phone or waiting for an email response, consumers can skip a human conversation and get answers instantaneously from a bot. This service-oriented functionality is still at the core of chatbots, but savvy companies are starting to leverage chatbots to generate added business value. In today’s digital landscape, chatbot usage and acceptance reflects consumer trends and behaviors. Convenience and accessibility are also major factors. You see, new generation chatbots are running on established messaging apps such as Facebook Messenger, which touts an impressive 1.2 billion users. This means companies can provide a chatbot service in a space that billions of consumers already utilize; and billions of consumers won’t be required to download additional software to take advantage of the service. Major brands and forward-thinking companies are getting creative with chatbots to reduce human error, cut costs, grow revenue, engage customers, and elevate customer service. In the Consumer Goods industry, manufacturers are inviting their retail customers to place orders and review new promotions using a 24/7/365 chatbot. 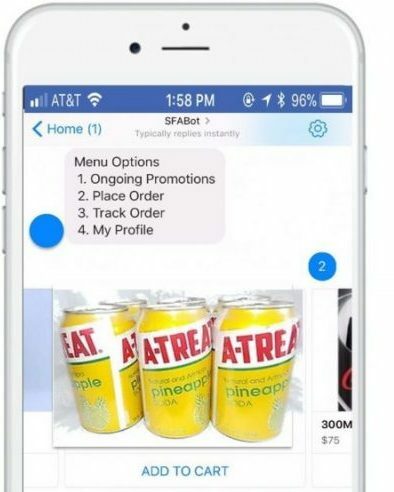 This self-service Sales Force Automation (SFA) chatbot gives retailers the power to manage restocks, track orders and research promotions before or after a field rep visits the store. A study by Business Insider discovered that 33% of all consumers and 52% of Millennials prefer to manage customer service needs via automated methods. Consumers have also decreased contact with live human customer service reps by 10%. When the field rep arrives to conduct a store visit, he/she can breeze through the order taking and dedicate the visit to relationship building and business development. The SFA chatbot enables the field rep to get in, get out and visit more stores. In most cases, introducing this new level of customer care via chatbots requires nothing more than a smartphone and Facebook Messenger. No doubt, machine learning and AI will continue to evolve and business innovation surrounding chatbot technology is far from the finish line.